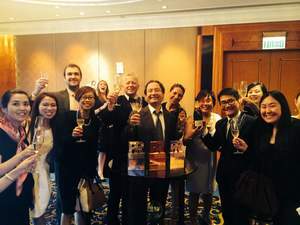 SHANGHAI, CHINA--(Marketwired - Jun 24, 2015) - Ruder Finn Asia (www.ruderfinnasia.com) won the PR Week Gold Award for Greater China PR Consultancy of the Year at the PR Week Awards Ceremony held in Hong Kong on 18 June, 2015. In a highly competitive category, which saw numerous major public relations firms submit entries, the judges recognised Ruder Finn's work, people and performance in awarding Gold in the category. Ruder Finn also scored two Bronze Awards on the evening. In Singapore, Ruder Finn won Bronze for Media Relations Campaign of the Year for GrabTaxi "Rides Made Awesome" and in Guangzhou won Bronze for Best Use of Broadcast/Video for Cotton Council International for "'Mian is' Touch of Cotton, Touch of True Me". 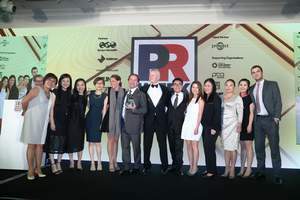 Gary Scattergood, Editor of PR Week, said today, "This category saw every major international firm in China submit entries and we congratulate Ruder Finn Asia on their victory. The firm has had a good year and this performance was recognised by the judging panel formed of both consultancy and client-side representatives. We wish them all the best as PR Week's Gold Winner of Greater China PR Consultancy for 2015." The PR Week Gold win marks another high point in a record-breaking year for Ruder Finn which saw the firm achieve five #1 market rankings in Greater China in the R3 Worldwide China PR Scope 2015 research (www.r3international.com). Ruder Finn was ranked by client-side marketers as the #1 PR firm in China across the priority business and performance categories of "Contribution to Business Growth", "Client Performance", "Market Insight", "Breakthrough Thinking" and "Campaign Effectiveness" in the R3 Worldwide study. In addition to five #1 rankings and increasing client satisfaction scores, Ruder Finn China also showed financial, client, new business and operational success in 2014 with year-on-year revenues increasing by 10% and profits by 42%. Ruder Finn China today employs 250 people and the firm's largest clients include Volkswagen Group China, Cartier, Sanofi, Michelin, Hermès, Longines, Omron, Bosch and British Columbia. A significant portfolio of new client wins has also driven business outperformance, including Alibaba, Shanghai Disney Resort, De Beers, Michael Kors, Richemont, Blancpain and Watches and Wonders. Elan Shou, SVP and Managing Director of Ruder Finn Greater China said today, "This is a wonderful result and it feels great to be the Gold Winner of PR Week's 2015 Greater China PR Consultancy of the Year! This is a win for everybody -- all of our team. Every day we strive to deliver great work, passion and commitment and this has now been recognised in these important industry Awards." Jean-Michel Dumont, Chairman of Ruder Finn Asia said today, "This is a huge win for us and marks an extraordinary journey building our Greater China business into a powerhouse of clients, talent, creativity and financial performance. We have built a business that can now be accurately defined as the Gold Standard for our industry in Greater China. The Award is a reflection of the outstanding work our China team does, day in, day out. Our people are constantly proving themselves and doing better and better work." Kathy Bloomgarden, Global CEO of Ruder Finn, said, "Ruder Finn Asia has truly set the bar for PR performance in Greater China with unparalleled results in one of the world's most important and dynamic markets. This incredible honor is a testament to our global commitment to progressing innovative communications in China, with the best creative ideas, superb client service and meaningful results -- focused on truly making an impact for our clients."